The Eynsford bed is a beautiful high foot-end bed with ornate feet and a sumptuous curved head and foot end. 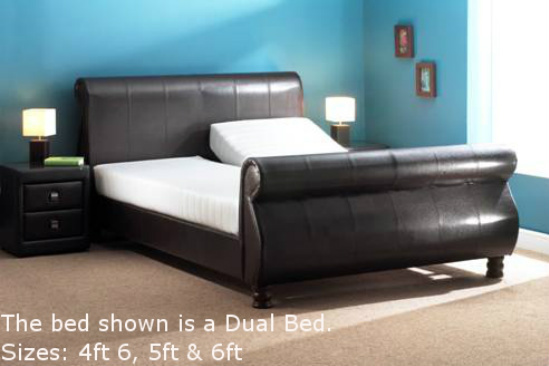 Not only is this is a stunning looking bed but if you are looking for a great nights sleep in a bed fit for a king this high quality eco leather bed is a must. This bed comes with a full 5-year warranty & Q-flex mattress unlike some other companies, we only sell beds made from the best quality materials and as with all our adjustable beds if you are not totally satisfied with your purchase within 7 days we will fully refund you the cost of the bed. Standard size for the Eynsford is 20 inches from the floor to the top of the mattress. If your bed is ordered with a Vertical Lift, an additional 4 inches will have to be added (standard height alteration charges apply), as it is not originally designed to support a Vertical Lift. The length of the bed is 7ft 10".